The Blue Devils jump out to an early lead, then hang on to earn their 21st win. Kyle Guy and Ty Jerome each scored 16 to lead Virginia (20-2, 8-2), which had a 13-game home winning streak snapped. 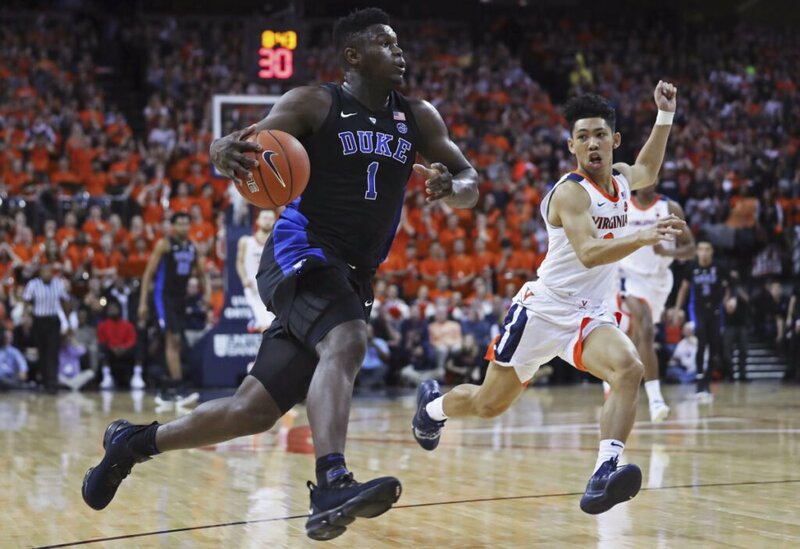 The Cavaliers lost to the Blue Devils at John Paul Jones Arena for the third straight time. The game had a sellout crowd, most hoping Virginia could avenge a 72-70 loss at Duke on Jan. 19. (1) TENNESSEE 73, FLORIDA 61: Grant Williams scored 16 points as Tennessee (22-1, 10-0 Southeastern) defeated Florida (12-11, 4-6) at Knoxville, Tennessee, to complete a season sweep of the Gators and extend its school-record winning streak to 18 games. (5) KENTUCKY 71, MISSISSIPPI STATE 67: P.J. Washington scored 23 points, Keldon Johnson added 13 and Kentucky (20-3, 9-1 Southeastern) held off Mississippi State (16-7, 4-6) at Starkville, Mississippi. (7) MICHIGAN 61, (19) WISCONSIN 52: Jon Teske had 17 points and 12 rebounds, holding his own inside against Ethan Happ, and Charles Matthews scored 16 of his 18 points in the second half to lift Michigan (22-2, 11-2 Big Ten) over Wisconsin (17-7, 9-4) at Madison, Wis.
(8) NORTH CAROLINA 88, MIAMI 85: Kenny Williams hit the go-ahead 3-pointer with 2:08 left in overtime to help North Carolina (19-4, 9-1 Atlantic Coast) hold off Miami (10-13, 2-9) at Chapel Hill, North Carolina. (9) MICHIGAN STATE 79, MINNESOTA 55: Nick Ward had 22 points and Matt McQuaid scored a season-high 18, leading Michigan State (19-5, 10-3 Big Ten) over Minnesota (16-8, 6-7) at East Lansing, Michigan. (10) MARQUETTE 66, (14) VILLANOVA 65: Markus Howard scored 38 points and Marquette (20-4, 9-2 Big East) hung on at the buzzer, edging Villanova (19-5, 10-1) at Milwaukee. CLEMSON 59, (11) VIRGINIA TECH 51: Shelton Mitchell scored 22 points with a career-best five 3-pointers as Clemson (18-5, 7-4 Atlantic Coast) outlasted visiting Virginia Tech (18-8, 5-5) for its fourth straight victory. (13) KANSAS 84, OKLAHOMA STATE 72: Dedric Lawson scored 25 points, Ochai Agbaji hit five 3s and had 23 points, and Kansas (18-6, 7-4 Big 12) shrugged off a slow start to beat Oklahoma State (9-14, 2-8) at Lawrence, Kansas. (22) FLORIDA STATE 80, (16) LOUISVILLE 75: Mfiondu Kabengele scored 22 points and Florida State (18-5, 6-4 Atlantic Coast) erased a 10-point second-half deficit to force overtime, then knocked off Louisville (17-7, 8-3) at Tallahassee, Florida. (1) BAYLOR 89, TEXAS CHRISTIAN 71: Kalani Brown scored a season-high 32 points on 11-of-12 shooting and Baylor (21-1, 11-0) stretched its Big 12 winning streak to 34 straight by beating TCU(8-15, 4-6) at Waco, Texas. (5) CONNECTICUT 109, TEMPLE 74: Napheesa Collier tied a season high with 30 points and grabbed 14 rebounds, leading UConn (21-2, 10-0 American Athletic) over Temple (8-15, 4-6) at Hartford, Connecticut.